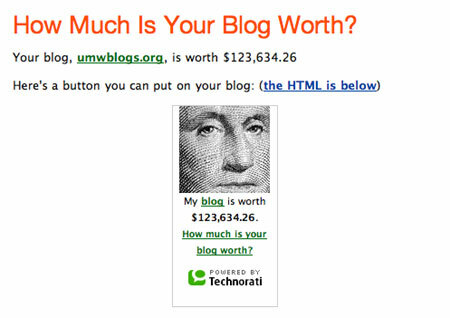 Well, Martha and I were discussing this yesterday, and given that UMW Blogs is now worth well over $120,000–which given the current deflation of the US dollar just ain’t what it used to be–we were hoping some unsuspecting Canadian business (high on the newfound power of their currency) would buy UMW Blogs so that we can finally afford that BlackBoard Enterprise we’ve always wanted. And hey, if we get full value we might even be able to put a little bit towards the down payment of our SPSS licenses. Not bad for a three week investment, right? I am in the wrong business, I should have been in the bloodsucking business of helping people re-finance their blogs for the last three years, what was I thinking? In fact, barring a complete economic collapse in the USA, we may even hold on to UMW Blogs for a bit longer, for given the recent trends we can only expect our investment to further grow, and the wealth and riches to amass accordingly. At this rate we might even be able to buy BlackBoard in another couple of months. Or even afford a Java programmer. The new blog and user activity is starting to level off, but the posts and comments are not. As of now, which is actually less than 30 days (25 to be exact) there have been 3,707 posts and 1,962 comments, keeping in mind that these numbers also include the 630 default posts and comments created with the new blogs. Moreover, our Technorati authority (which with 75 cents will get you a cup of coffee on the streets of NYC) is 219 in just over three weeks time. Not necessarily an indicator of anything other then the fact that UMW Blogs will be ever more likely to show up in Google and Technorati searches making the work we are doing here at UMW that much more apparent and transparent. Wow, is this cool or what? This entry was posted in UMW Blogs, WordPress and tagged wordpress mutli-user. Bookmark the permalink. I’m ready to invest in UMW, where’e the prospectus? And I have no idea what I had in mine when I said that statement, it certainly was not a criticism. I know it wasn’t a criticism, it was a necessary dose of reality. It seems like things have been going so smooth in relationship to more general paranoia, concern, general reactionary responses that I myself keep thinking whether it’s possible that we continue to be so lucky. I guess maybe we can.